This year Joyful Hermit decided to take indoor greenhousing to a higher level. The flats of annuals costs rise yearly, and finding sales is hit-and-miss. 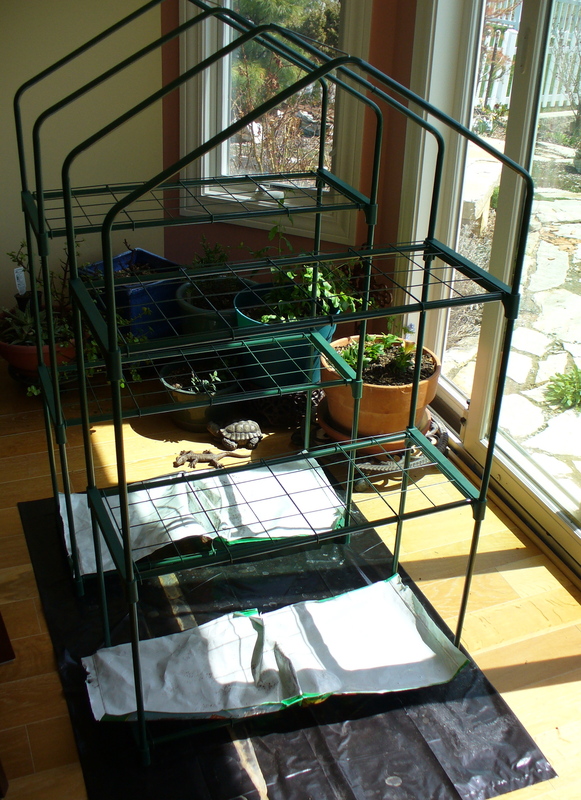 Big Lots had three-shelf greenhouse units for $20 each; JH purchased two, on separate days so as to get the Rewards credit. Big Lots is on the way between hermitage and Cathedral, so a minor stop. The units are simple to construct, lightweight, and can be used at other times in the garage for added storage of light-weight items. One year Joyful tried indoor seeding using flats with plastic dry cleaning bags to cover. 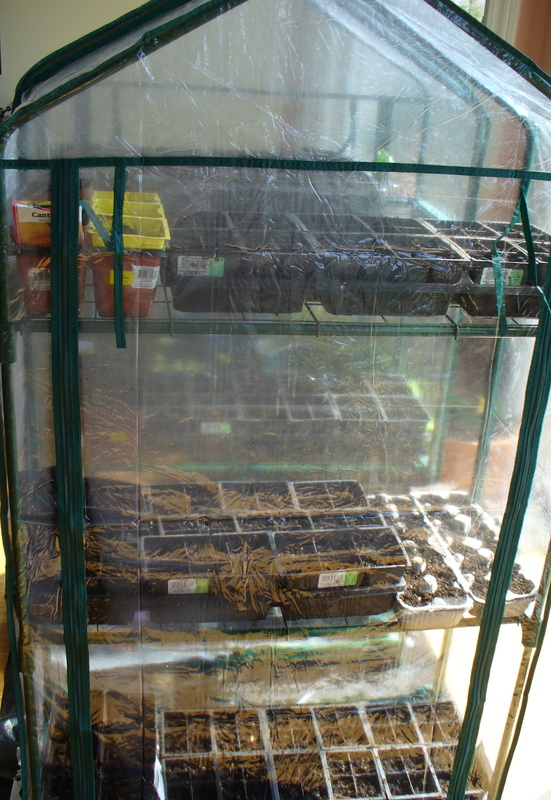 This technique worked marginally; the plants seemed spindly and outgrew the plastic covering. Plus, they took up more space. These shelving units are compact. Using planting containers saved from previous years’ annual purchases, Joyful painstakingly one night filled each tiny seed pot with seed starter soil purchased the year before, on sale. 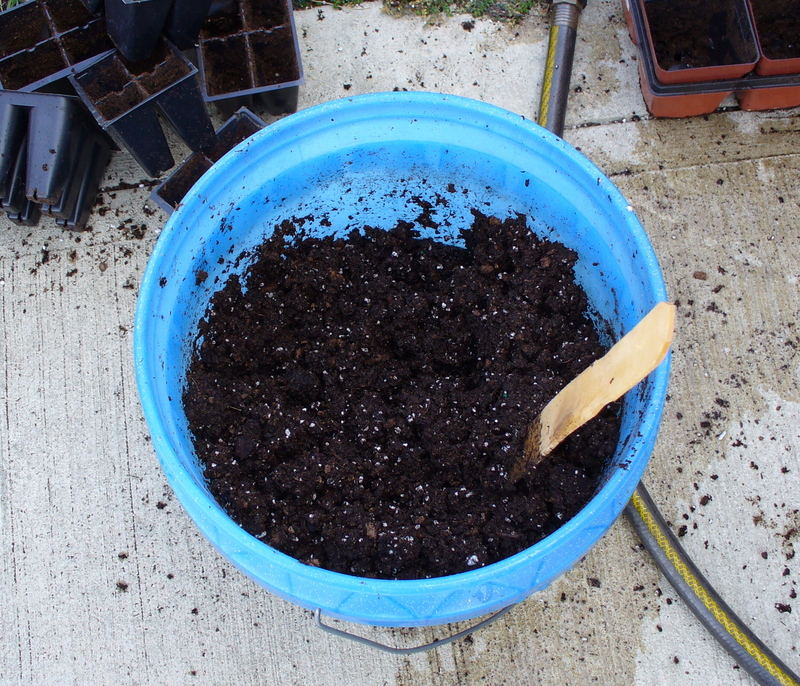 The next morning when it was time to moisten the starter soil, the task was nearly impossible. After-the-fact research revealed that seed starter (good composition, holds moisture, and without weed seeds) is not soil and thus difficult to moisten initially. So each filled pot was dumped into a bucket, water added gradually, then stirred–much as one mixes plaster or cake mixes. 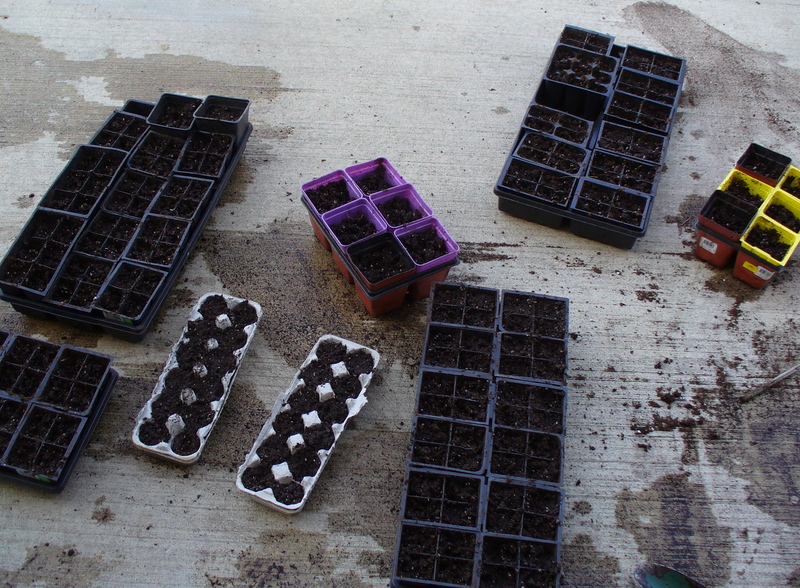 Then each tiny pot, plus a couple cardboard egg carton bases, were refilled with the moist seed starter. (All this done joyfully, of course!) Next, using a dowel, JH made a little hole depending upon recommended seed planting depth, and placed the desired seeds in each hole. Granted, it is a humble task but provides opportunity for pondering. Joyful considered that these very peaceful tasks many humans no longer do, preferring to give the jobs to other humans to do…plus pay $15 for a flat of annuals that cost JH $2, provided peaceful contemplation, therapeutic mud play, and leg-squat exercise. 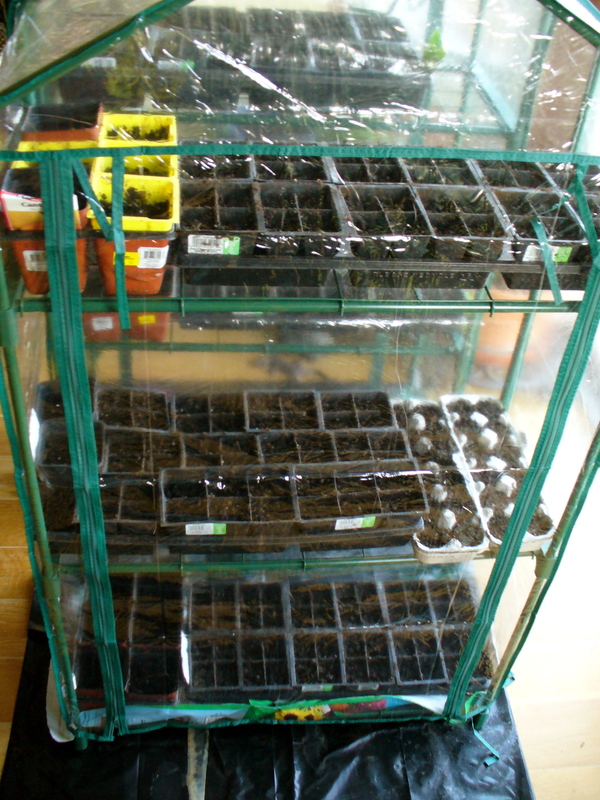 Joyful Hermit placed the seed trays on the shelves in the sunny nook. By morning, condensation already occurred. Solar garden lights will be used at night to add light for growth. We’ll wait, watch and pray for seed success. JH couldn’t help but think how much fun this project would be for a child–or the child in each of us–who likes dirt and seed intrigue! This entry was posted in Cost Savers, Gardening. Bookmark the permalink. Your project does sound like fun! I hope the plants do well.